Tomislav Radovanic, a retired Math professor from central Serbia has built a house of waste plastic. "The house is comfortable and it practically cost me nothing," Radovanovic said, adding that the bottles are good insulators. 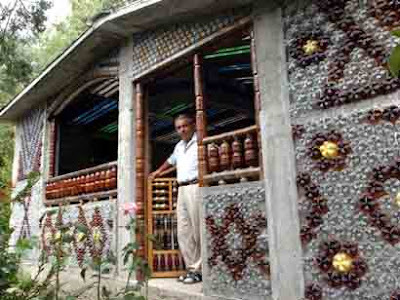 The foundation is concrete but all else is plastic; gutters, windows and furniture are made from recycled bottles.